A CCTV kit offers complete coverage for larger or commercial properties. The kits come with a digital video recorder (DVR) that acts as the hub and storage for all your footage. They record constantly, and depending on the hard drive size, can offer up to several months of footage to review should you need to. Some allow you to manage and view footage on your smartphone or tablet, so you can always check up on your business or home when you're away. We list both the number of cameras and number of channels of our CCTV cameras. The number of cameras is the amount actually supplied in the box, while the number of channels is the number of cameras that can be connected to the DVR. Infrared night vision allows the CCTV cameras to see and record in the dark. The distance that this works at varies between cameras, so make sure you choose a CCTV kit with good enough night visibility for your surroundings. The capacity refers to the amount of storage the DVR has for saving footage. Once the hard drive is full, the oldest files get recorded over, so a larger hard drive allows you to view footage from further back - great if you travel or have a lot of cameras set up simultaneously. CCTV picture quality is measured in TV-lines. This refers to the horizontal number of vertical lines across the image. The higher the number, the clearer and more detailed the picture, which is important if you're recording a large space or a property from far away. Along with the DVR, some CCTV cameras connect to your WiFi network. This means you can log in using your computer, tablet or smartphone and view a live feed from any of the cameras in your network - great for keeping an eye on your property while you're away. 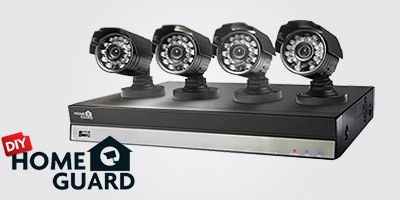 CCTV camera kits allow you to constantly record several locations around your property simultaneously. Well placed CCTV cameras can capture every angle of a building for complete visibility and security. A DVR is included with all CCTV kits, which all the cameras connect to. It is constantly recording everything the cameras pickup, so you can review a week's worth of footage from multiple angles. As CCTV cameras need to be installed, they can be placed in locations unsuitable for smart cameras, such as on high walls for better visibility. 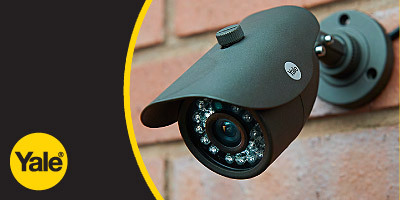 CCTV cameras feature weatherproof casings, so work perfectly in all conditions. Installing CCTV outside your home for security and peace-of-mind is well within your legal rights. However, there are a few things to think about before you install a home security system. Any cameras you install must only be used for the purpose they are designed for. This means they can only be aimed at property you own, and cannot be pointed at a neighbour's house, a public place or be used to violate the privacy of others. 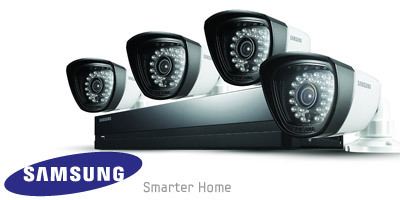 CCTV cameras used for home security do not need to comply with the Data Protection Act. However businesses do, so legal advice is recommended before installing CCTV for business or professional use. The only thing home users need to remember about the footage captured is that it cannot be shared online or with other people, unless used in a criminal investigation. Businesses must keep all recorded footage secure and comply with the Data Protection Act. If you use your home CCTV or smart camera for its intended purpose, you won't run into any trouble.